If you're a firm believer in the old adage that when you want something done right you should do it yourself, you may want to reconsider your position when it comes to freshening up old artwork. 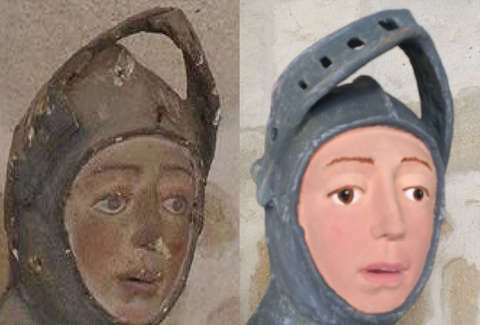 Or at least you probably should once you take a look at this 500-year-old wooden statue in Spain that was recently "restored" by a local handicrafts teacher without the guidance or help from any experts. Is there a version of Botched, but for medieval artwork? The abysmal restoration job, which has resulted in what can only be described as a life-sized manifestation of a secondary Shrek character, happened in the Spanish city of Estrella-Lizarra. The victim is the 500-year-old wooden effigy of San Jorge de Estella, which sits in the Chapel of San Jorge inside the Church of San Miguel, and depicts San Jorge in a suit of armor slaying a dragon. Apparently, local parish priests decided the old piece could use a bit of a facelift and enlisted the help of a handicrafts teacher from a nearby school to do the job. In the process, the teacher took some rather bold liberties by essentially sandblasting entire sections with new color with a near-total lack of subtlety. In fact, they opted to turn the horse's harness red when it was originally silver with gold leaf, according to an art restoration expert. And in case it wasn't obvious, the whole thing was reportedly done without consulting any art restoration pros or any cultural institutions. As a result, the work's new look has caused quite the brouhaha, and even the town's mayor, Koldo Leoz, is pissed. It seems Spain still hasn't learned its lesson when it comes to well-intentioned amateur art restorers, as just a couple years ago in Borja a would-be do-gooder attempted to freshen up the deteriorating 18th Century Ecce Homo fresco, but in the process transformed the beloved visage of Jesus into a monkey. It's unclear just how much damage was done to this latest priceless piece of art, or how this sort of thing was allowed to happen, but the Association of Conservators and Restaradores of Spain is reportedly planning to take things to the Prosecutor's Office of Navarra to get to the bottom of things, according to Gizmodo. Further proof that there are plenty of DIY projects you definitely shouldn't DY.